Day 24 at sea: Ok Rosie, we’re ready for you. I am calling the storm Rosie now, in a bid to befriend her. I don’t usually shout at storms or the sea but maybe I will this time, now that I know she has a name. (The system is Typhoon Mawar – the latter meaning Rose in Indonesian). I am rather hoping that all of the models turn out to be wrong and that Rosie wanders off to play elsewhere. Or that she turns out to be like the Rosies I know who are all rather lovely and lots of fun. Keeping a level head on, however, as to the likelihood of either of those scenarios, I have prepared for the worst conditions possible. Needless to say I shall not be blogging until it is all safely over and we are happily out the other side. In other very fantastic news… today I confronted my fear of deep water and went swimming for the first time since leaving land. It took two attempts and 8 full minutes of sitting on the side of the boat but eventually I got in. I loved it – naturally. I always do, but the simple act of stepping over the edge and letting go of the boat freaks me out – for reasons I still don’t understand. I bartered with myself this time, saying that with the impending storm on its way (which I know is going to be very scary and potentially painful) I was being a wimp if I didn’t get in the water now (which I knew probably wasn’t going to be at all scary, dangerous or painful). I am so daft but I guess that fear of letting go and getting out of your comfort zone is universal, whether or not you are over 6,000 metres of ocean blue. Final fantastic news was my second birthday party yesterday, after I found a stash of cards tucked away in a locker. It wasn’t obvious which were birthday cards and which good luck notes so I opened them all. Highlights included a bottle of bubbles and a beautiful piece of fluorite cut into a smooth disc for holding when you are scared. Perfect timing – thank you Heather and Cameron. My brother Michael had given me some gin tokens in Canadian dollars, so now I have a real incentive to make the other side. I nearly forgot – the most fantastic news of the last two days has been the turtle who drifted by yesterday afternoon. I named him Taid – Welsh for Grandfather, in honour of my late Taid. Prehistoric looking, slow-moving and gentle. And with that, I shall return to waiting for Rosie. 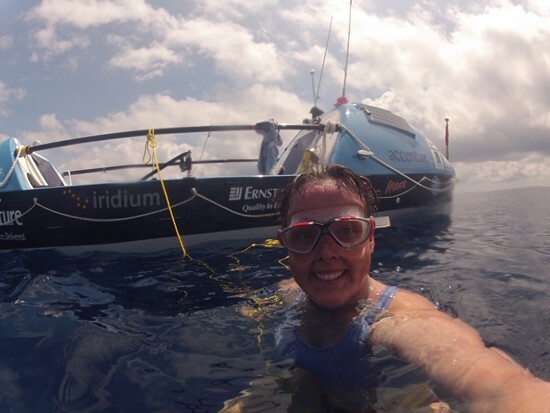 24 Responses to Day 24 at sea: Ok Rosie, we’re ready for you. Rosie…that bubble-headed robot from the cartoon the Jetsons when I was a child! Sweet character! I shall fully expect this upcoming Rosie to treat you and Gulliver as sweetly! Batten down, stay safe and cozy and dream of another swim! I feel obliged to give a shout out to you, Sarah, as this one-way relationship I have with you is just feeling strange. I think and talk about you daily with my Seisen students and fellow teachers. In fact, I think that some check on your progress via me instead of your website. Now that the school year is almost done and I am heading home, I have informed all of my Canadian friends and family about your quest so that they can keep up with your travels and my running commentary of “things Sarah would/would never say.” (I recommend you post this topic as a blog and enjoy the comments) Wishing very much that Rosie is gentle and that “Sarah” may say, “Ahhhh that wasn’t so bad, eh?” in a few days. There are so many of us thinking of you. As I read your blog I am watching the Queen’s fly-past over Buckingham Palace on tv….no match for your “fly-past at sea” Sarah :). I am right there with you Sarah on your “fear of deep water” and letting go of the boat and getting in for a swim….it’s an awful feeling…but you conquered it…bravo! (I am STILL sitting on the side of the boat…lol.) But then you had your lifeguard Taid watching over you….great pic. Safe ride with Rosie…let’s hope she’s sweet…and gentle with you. Thinking of you weathering Rosie. Well done conquering your fear of swimming in the deep – I know exactly whet you mean though. As an accomplished swimmer & experienced diver, I still get serious heebie-jeebies swimming in deep ocean. I love the smile of triumph on your face while having your deep water swim. Well done. I especially was happy to note that Gulliver had hold of you with the tether line. Hope Rosie is NOT a thorn in your side. On your MP3 you have a song called Rosie … got to Fairport Convention and the Album called Rosie, it is the title track. There is even a line in it that says “lie down cosy and lets learn to take things slow” … which is I guess what you will be needing in the next few days. Take care and enjoy the Mars Bars ! When in doubt, eat a Mars Bar! After all you have an MBE reputation to hold! It is now 2:20pm in Tokyo, and I am sending all positive thoughts with all my might towards your direction. Go away Rosie! Take your thorny stem elsewhere! Hang tight, Salty Mouse! Wow, you are so brave ! I totally get your reluctance to let go of your boat and go swimming in deep water, you are amazing. Good luck with Rosie -I hope her thorns and petals fall off long before she reaches you. Congrats on being logical and having fun! I see you were wisely tethered to Gulliver during your swim via the yellow rope. You can do anything you want to do if you can focus. Nothing to fear, but the fear itself. Be well. Have fun and we all wish you a smooth ride. Amazing photos Sare, how great to have had Turtle Taid as a companion to take your mind off Raging Rosie. Strap yourself in and keep safe for us – I hope you’ll be able to blog soon so that we know you are ok.
My fingers are crossed that the storm will pass you by with minimum disturbance. We Yanks call it a worry stone. you rub it with your thumb and when the stone is gone so are your troubles. Gulliver: You keep our girl safe now, you hear?!? You and Gulliva were definitely missed in the Queens Jubilee flotilla on the Thames. Quite spectacular but definitely incomplete without the two of you. Bravery is definitely something you are not short of dear Sarah:) May all the turtles, albatrosses, mermaids and fish protect you and hopefully Rosie re-routes! Thank you for that brief but accurate memory of my dear friend “Taid”. God bless you Sarah. Cheers from Gwynfor, Jane and the young growing family. Good luck ! Are you OK to meet with Typhoon Rose ? Wish you & The Gulliver in Safe !! We’re with you in spirit, as always, Sarah. Take care. PS loving the photos and blog; keep them coming when you can! Sarah, things have obviously taken a turn for the worse since I posted a comment a few hours ago. I do hope you are staying safe. Not long to go now before help arrives. God bless. You have been in my thoughts and prayers more than ever over the past few days and overjoyed to hear you are safe. There are many of us out here who don’t get in touch but who follow your exceptional journey, share your news on fb and with work colleagues, so from the ‘numerous unknowns’ ……….Well done, congratulations, and we look forward to hearing what plans you will make for your next adventure. Oh, and your mother has been the subject of many a conversation. What an extraordinary lady she must be and she hasn’t been forgotten in our prayers either.